The tracking for the racking sequencing may be created for any punchcard, whether punched holes are required in the card for patterning or not. The image below is taken from the Brother Ribber Techniques Book. If KC is used, no holes are punched, and the carriage is set to plain knit, though the card advances, all needles knit. End needle selection is not a factor. In the card, for use on Brother, the first row of the repeat with machine on racking position 10 would be placed on row one pre marked position found on stock brother blank cards. Always check markings for your machine. I have a roll purchased for Brother kms specifically that actually are stamped for Studio, with # 1 two rows below where it should be on right. No holes need to be punched in this instance. Needles are brought into work and filled as illustrated in the ribber book page. 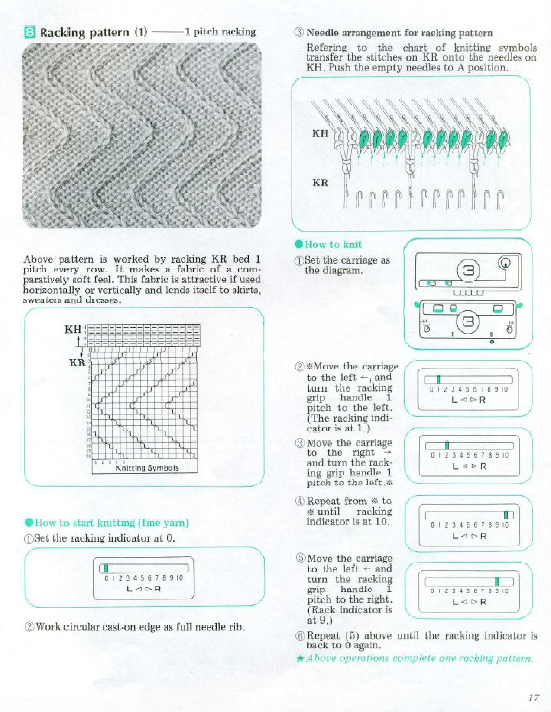 Knit one row across stitches with card set to advance normally. In this instance marking row numbers in preferred colors will indicate when the racking sequence changes direction. Green rows rack to left, orange to right. 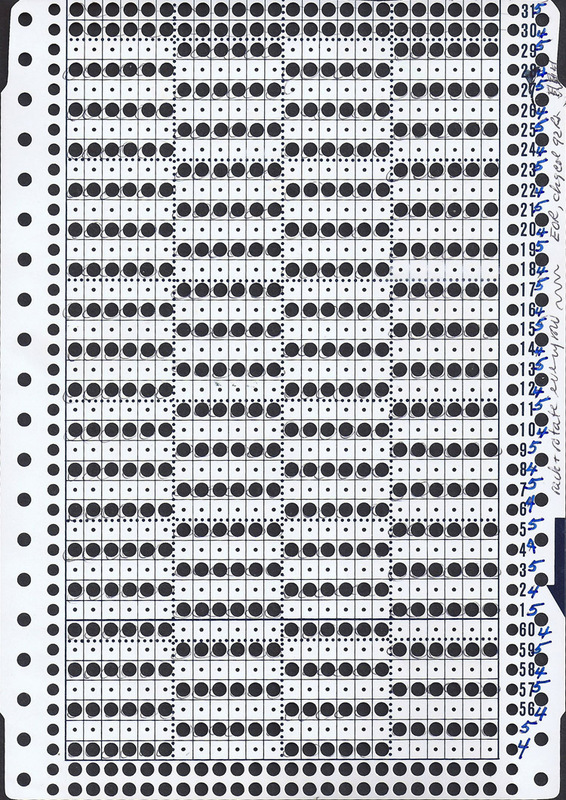 The racking handle position repeat is 20 rows high (shown on left), a minimum of 36 rows for the card to roll properly) is met by repeating it twice, and the “motif” is broken up to accommodate the fact that the reader is working on 7 rows below row number visible on machine exterior. Rows 34 and 35 would become the 2 every square punched rows always placed at the top of pattern cards. The blue numbers on right reflect racking handle position for that row before the next row is knit. They can be marked on any blank square if card is blank, or alongside existing row numbers as seen in the punchcard for the checkered swatch. It is helpful to have consistent habits if one needs to stop for any length of time ie. always knit row, rack to position or stop after knitting, rack upon return. Machine can be set for double length for racking after every 2 rows knit.